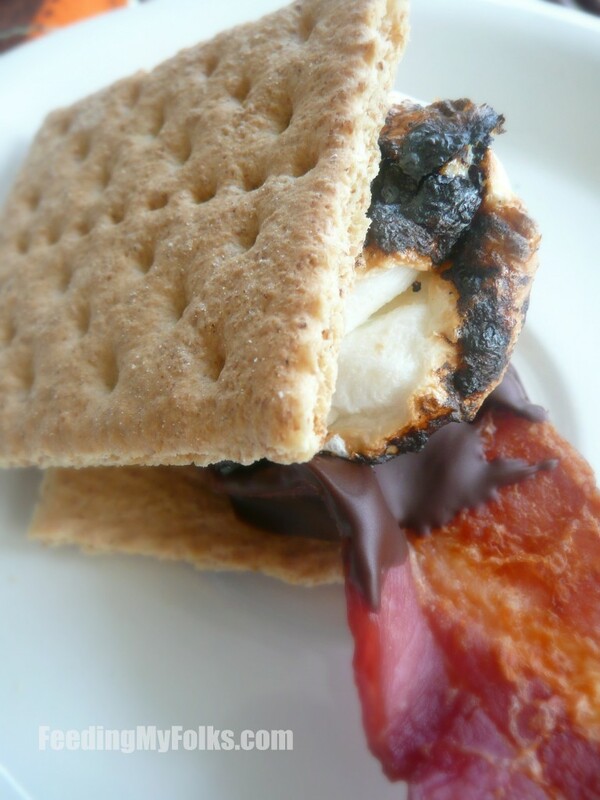 The look on my mom’s face when I told her about this bacon s’more recipe was of complete disgust. She even hesitantly repeated what I had just asked her to buy at the store – bacon, marshmallows, and chocolate. No mom…no, you did not mishear me! Even after bringing those ingredients home, she still wasn’t convinced the flavors would go together. For some reason she just didn’t understand that the saltiness of the bacon with the sweet chocolate would be heaven. Especially combined with crumbly graham crackers and a gooey marshmallow! Well…now she knows! So you’re probably thinking “Stephen, why are you making s’mores when you’re not camping?”. Great question! Cause I wanted to haha. Seriously though, despite global warming, it was pretty chilly out this weekend. And after doing yard work for a few hours (improperly dressed, as usual), I decided there was no better way to warm and fuel up than to gorge on s’mores. In order to make it special, I snuck a slice of bacon into that familiar chocolate, marshmallow, and graham cracker sandwich. The recipes is super simple too (as all campfire foods should be). 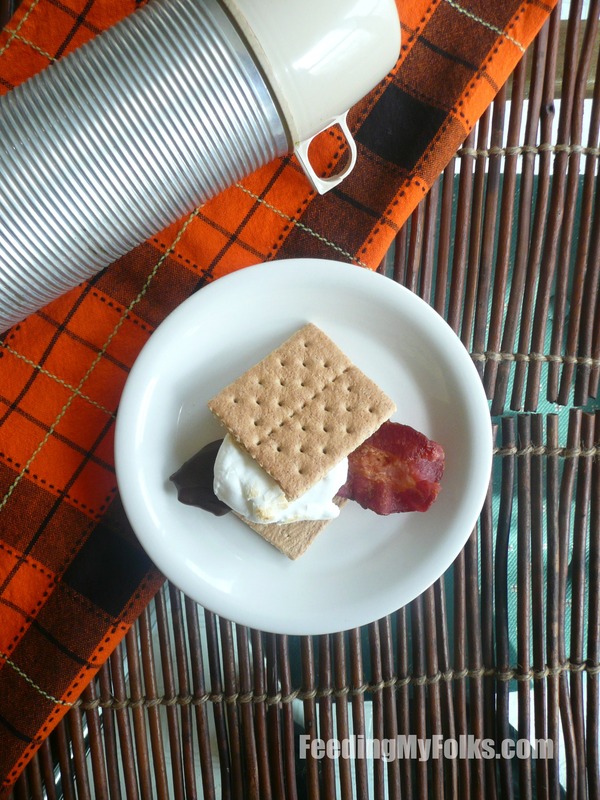 Dip a crispy piece of bacon in some melted chocolate, layer on a toasted marshmallow, and sandwich between two graham crackers. Wah-lah! Easy, right? You don’t even have to wait for the chocolate to cool. Melted chocolate is delicious! If dipping the bacon in advance (like I did), go for it. Those suckers will become like a bacon chocolate candy bar. This makes it easier to transport and/or to save some for later. Gosh, I love salty and sweet. As per the instructions on the package, cook bacon until crispy. Put cooked strips on a paper towel lined plate (the paper towels absorb excess fat). Melt the chocolate over a double boiler. Stir until melted. Dip crisp bacon into melted chocolate. Place dipped strips onto a wax paper lined plate to cool or directly on a graham cracker. Toast marshmallows over open flame (campfire, gas stove top, candle, etc). 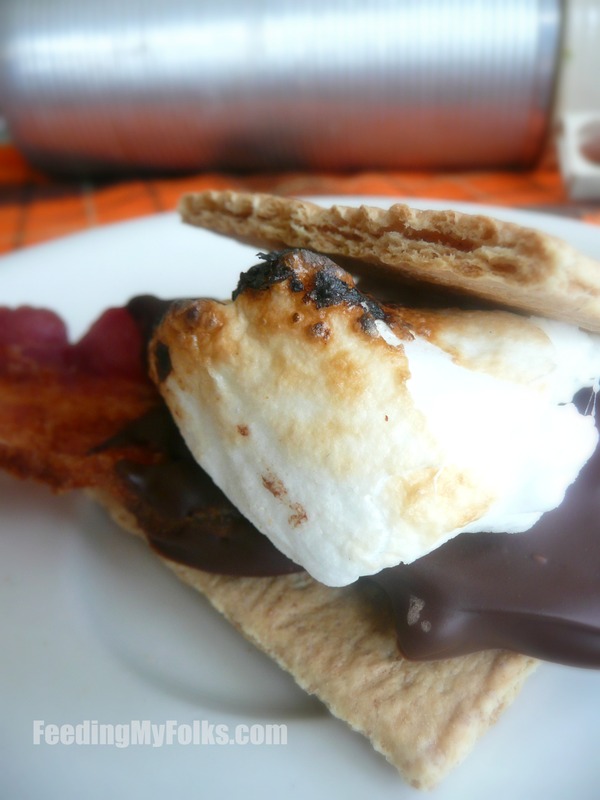 Place toasted marshmallow on chocolate bacon. Sandwich with a graham cracker. This is the best recipe ever! Bacon forever! Can I just say that you burnt your marshmallow perfectly? I always liked them a little charred. I’m definitely going to have to get some bacon now! I’ve started loving it over the past few months for some reason. Yum! Thanks, Jen! I agree – a little char takes the toasty marshmallow to a whole other level. It’s a great flavor combo. The recipe is really simple to do too. Let me know what you think when you try it!